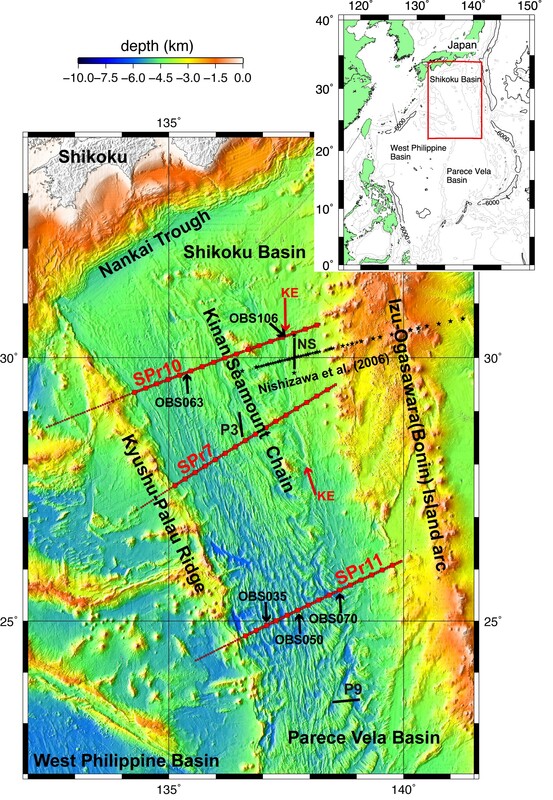 Seismic refraction and reflection measurements were made along three profiles across the Shikoku Basin, one of the three backarc basins on the Philippine Sea plate. The P-wave velocity models show the presence of a very large horizontal irregularity related to the seamounts on the extinct spreading center, transition zones from the Shikoku Basin to Kyushu-Palau Ridge, and from the Shikoku Basin to the Izu-Ogasawara Island arc. However, the other areas were found to have features similar to those of a normal oceanic crustal model composed of oceanic Layer 2 with a high velocity gradient and Layer 3 with a small velocity gradient. The Shikoku backarc basin oceanic crust was found to be characterized by a thinner igneous crust, especially in Layer 3, and the azimuthal anisotropy in the uppermost mantle expected from the seafloor spreading was not detected. The Philippine Sea plate consists of three backarc basins, the Shikoku Basin (SB), Parece Vela Basin (PVB), and West Philippine Basin (Fig. 1). The SB and PVB were produced at 30–15 Ma at moderate half-spreading rates of 2.0–4.7 cm/year, and the Kinan Seamount Chain lies close to the extinct spreading center of the SB (e.g. Kobayashi et al., 1995; Okino et al., 1999). In the 1960s, P-wave velocity (V p ) models of these marginal basins in the Philippine Sea were obtained by two-ship refraction experiments (e.g., P3 and P9, shown in Fig. 1) by Murauchi et al. (1968). These researchers analyzed the observed travel time data using a slope-intercept method and obtained the layered V p models. Based on these results, they concluded that the backarc basins of the Philippine Sea plate have a fairly normal oceanic crust similar to that of the Northwestern Pacific Ocean. In the years following this study, there have been few seismic surveys of these basins. Bathymetric map of the Shikoku Basin and surrounding areas based on multi-beam bathymetry. Red lines show the positions of three seismic lines across the basin. Red arrows show the position of the Kinan Escarpment (KE). Black asterisks and a north-south (NS) line indicate the OBS positions and a seismic refraction profile by Nishizawa et al. (2006). P3 and P9 are the locations of the two-ship experiments by Murauchi et al. (1968). We recently obtained a detailed V p model for a normal oceanic crust in the Northwest Pacific Basin (NPB) using a modern seismic exploration method (Oikawa et al., 2010). Our results revealed that the oceanic crust in this basin was predictably homogeneous but that the uppermost mantle was unexpectedly heterogeneous with large azimuthal anisotropy. In 2005 and 2006, we carried out three long-offset wide-angle seismic and multi-channel seismic reflection (MCS) experiments across the SB using a large airgun array and a large number of receivers. The data were analyzed using a combination of forward modeling and tomographic inversion techniques identical to those used by Oikawa et al. (2010). 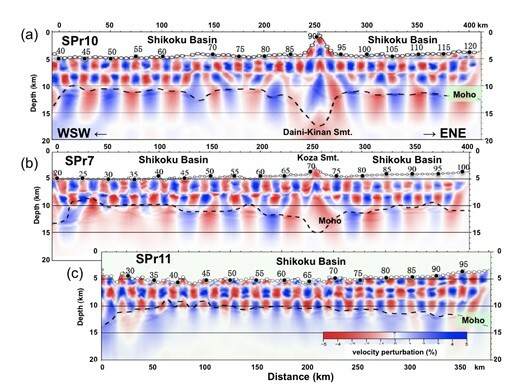 In this paper, we present detailed seismic velocity models that characterize the structure of the Shikoku backarc basin and discuss the differences between these models and the V p model of an oceanic crust created at a mid-ocean ridge. We conducted a seismic survey consisting of MCS and wide-angle seismic measurements using dense ocean bottom seismograph (OBS) receivers to update the velocity model of the SB, which is a typical backarc basin. Since Bouguer gravity anomaly data indicate that the SB crustal thickness decreases toward the south (e.g. Ishihara and Koda, 2007), we located seismic lines at the north, center, and south of the basin to characterize this variation (Fig. 1). The direction of the seismic lines is roughly east-west, parallel to the direction of the backarc basin spreading, with a half-rate of 2.3–4.7 cm/year in 27–20 Ma except for the last NE-SW spreading stage, which occurred at a slower rate of 2–3 cm/year in 20–15 Ma (Okino et al., 1999). A tuned array of 36 airguns with a total volume of 8,040 inch3 (132 l) was used as a controlled seismic source and shot at an interval of 200 m (90 s) for the wide-angle seismic measurements and at 50 m for the MCS (480 channels, 60 fold) measurements. OBS receivers were deployed at a standard interval of 5 km. The procedure for data processing and velocity analysis was the same as that used by Nishizawa et al. (2007, 2009). The OBS travel time data were modeled by tomographic inversion (tomo2D; Korenaga et al., 2000) and two-dimensional ray tracing using the graph method (Kubota et al., 2009), and field data were compared to synthetic seismograms (E3D; Larsen and Schultz, 1995). The resolution and reliability of our velocity models were examined using a checkerboard test of the first arrival tomographic inversion. We constructed the initial checkerboard pattern by adding sinusoidal velocity anomalies with a maximum amplitude of ±5% to our preferred final model. The resolution of the model is indicated by the degree to which the introduced velocity perturbation is reproduced. The pattern of the velocity anomalies was generally well recovered down to a depth of about 8 km below the seafloor (Fig. 4). Checkerboard test results for the P-wave velocity models shown in Fig. 3. The size of the checker pattern is 10 km horizontally by 2.5 km vertically in the region shallower than 10 km for SPr10 and SPr7 and 11.25 km for SPr11. The size increases to 20 × 10 km for the deeper area. P-wave velocity models for each line shown in Fig. 1. The models are only displayed for the SB region. Red vertical broken line indicates the inferred location of the extinct spreading center. White circles and black arrows on the seafloor show the positions of OBSs. Iso-velocity contours with an interval of 0.25 km/s are shown. The position of the Kinan Escarpment based on the seafloor topography is shown as KE. The results of the MCS profiling (Fig. 2), P-wave velocity models (Fig. 3), and checkerboard test (Fig. 4) for each line from north to south are shown. We also describe the characteristics of these parameters. Time-migrated multi-channel seismic reflection records for each red line shown in Fig. 1. Red arrow shows the position of the Kinan Escarpment (KE). The areas in the red squares are enlarged in the dotted red squares for each line. The record section obtained at OBS106 on Line SPr10 (Fig. 5(a)) is characterized by many small undulations in the first and later arrivals, a very small amplitude of P n arrivals, and a large amplitude of the later phases up to offset of approximately 60 km. The result of the tomographic inversion shows that a thin crust with a thickness of 5–7 km exists along SPr10 except for the area of the Daini-Kinan Seamount on the paleo-spreading center (Fig. 3(a)). The checkerboard test result in Fig. 4(a) indicates that the patterns are recovered down to the Moho depths except beneath the seamount. The root mean square (RMS) misfit for the first arrival tomographic inversion was 36 ms.
(a) Record section for the vertical geophone of OBS0106 on SPr10. The position of the OBS is shown by an arrow in Figs. 1 and 3. A gain factor proportional to distance has been used to enhance the distant seismograms. The reduction velocity is 8 km/s. P c : crustal arrivals, P n : refractions from the uppermost mantle, P m P: mantle reflections. (b) Calculated travel time curves superimposed on the observed record section (top) for the final velocity model (bottom). Ray diagram is also shown in the bottom. (c) Calculated travel time curves (top) for the test model with high V p at the base of the crust (bottom). On the ENE side of the OBS, the calculated later arrivals could not reach over an offset of 50 km. Clear later arrivals propagating through the crusts and the Moho reflection (P m P) shown in Fig. 5(a) could constrain P-wave velocities (V p ) of the deeper crust and the Moho. Since the travel time inversion code of tomo2D uses first arrivals and reflections (e.g., P m P), but does not use later refraction arrivals, we inferred the deeper part of the V p model so as to explain the later arrivals by using the forward modeling method. Figure 5(b) shows a good fit of first and later arrivals for the final model with a V p = 6.9–7.0 km/s at the crust bottom. We examined a test model with a high V p lower crust to verify our final model. The test model has a 1.5-km-thick layer with V p = 7.3–7.4 km/s at the base of the crust in the region within 80 km east of Daini-Kinan Seamount (Fig. 5(c) bottom). The V p gradually increases to 7.4 km/s at the crust bottom in the more distant eastern region. The test model was also able to explain the observed travel times of the first arrivals. The later arrivals, however, could not reach over 50 km eastward from the OBS. Even if a thicker crust is assumed, the apparent velocity of the calculated later arrivals is significantly faster than the observed ones. Another example of the record section at OBS063 is shown in Fig. 6(a), which shows a reasonably good consistency both in travel times and amplitudes of the signals between the observed and synthetic record sections (Fig. 6(b)). Although the velocity gradient of the lower crust to the east of the OBS is small, namely, 0.01 km/s/km, the synthetics show a sufficiently large amplitude of later phases. In addition, the large velocity gradient in the lower crust could not explain the travel times of the later arrivals. Therefore, the final model for SPr10 can constrain the whole-crust velocity distribution with high reliability. 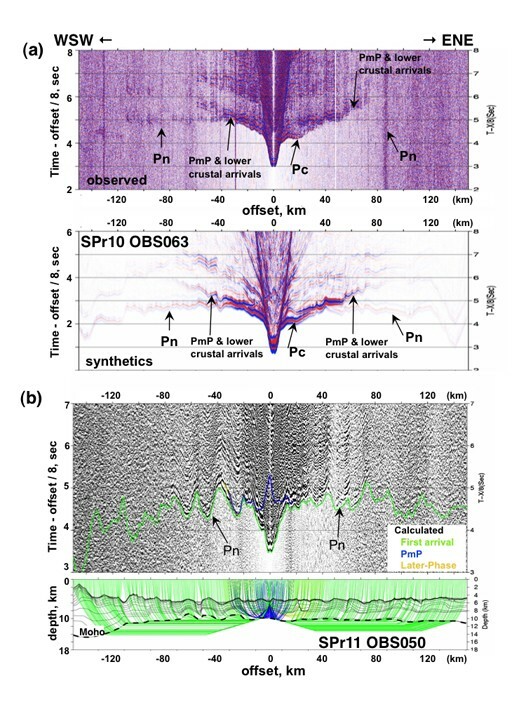 (a) Observed record section (top) and synthetic seismograms (bottom) for the vertical geophone of OBS063 on SPr10. The position of the OBS is shown by an arrow in Figs. 1 and 3. A gain factor proportional to distance has been used to enhance the distant seismograms. The reduction velocity is 8 km/s. (b) Record section (top) and ray diagram (bottom) for OBS050 on line SPr11. Calculated travel time curves are also plotted on the record section. The velocity structure of the SB crust along SPr10, excluding the Daini-Kinan Seamount region, is roughly divided into three layers: (1) the shallowest layer has V p = 1.6–2.5 km/s, which corresponds to unconsolidated sediments, and its thickness is constrained by the MCS record shown in Fig. 2(a); (2) the underlying layer has V p = 3.5–6.8 km/s with a large velocity gradient and a thickness that varies from 2.0 to 3.5 km along the line; (3) the V p of the third layer ranges from 6.8 to 7.2 km/s with a small velocity gradient. The V p at the bottom of the crust varies horizontally, and the total igneous crustal thickness is 5–7.5 km. The topmost mantle velocity, P n velocity, is almost constant at 8.0–8.1 km/s except beneath the seamount and transition to Kyushu-Palau Ridge (KPR) regions, where values of 7.8 km/s and 8.3 km/s are observed, respectively. The results of the tomographic inversion and checkerboard test are shown in Fig. 3(b) and Fig. 4(b), respectively. The RMS misfit for the inversion was 41 ms. Later arrivals propagating in the lowermost crust were detected in areas where the crust is thicker than 5 km (e.g., an area between OBS045 and OBS056), allowing better estimates of V p in the lower crust and Moho depth. The crustal model along SPr7 shows the same characteristics as that of SPr10 and consists of three layers. However, the thickness of the igneous crust except for the Koza Seamount region is 4–7 km, which is somewhat thinner than that of SPr10. The P n velocity along SPr7 ranges from 7.9 to 8.1 km/s. The observed record section at OBS050 on SPr11 (Fig. 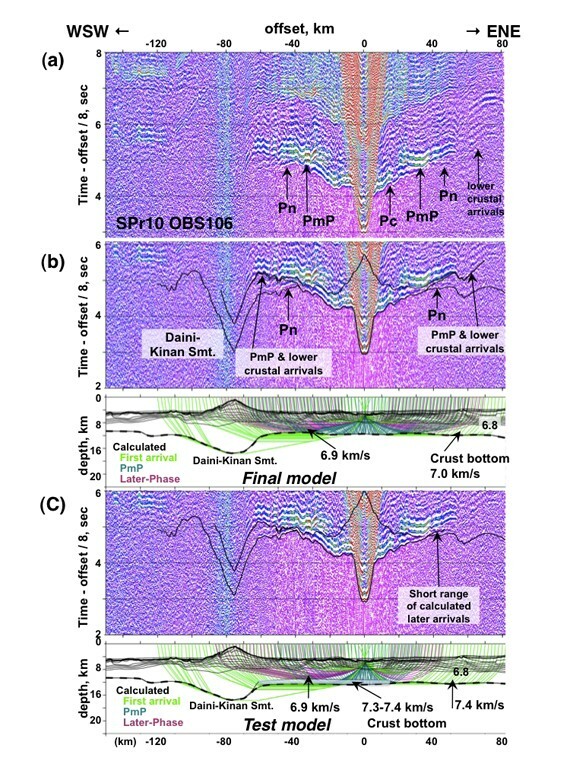 6(b)) shows strongly undulating travel time curves due to thin sediments and the very rough topography of the acoustic basement, as shown in the MCS record (Fig. 2(c)). Unlike SPr10 and SPr7, later arrivals, including P m P, are hardly recognizable in these records. The V p model derived by the inversion and forward modeling is shown in Fig. 3(c) and the checkerboard test result in Fig. 4(c). The RMS misfit for inversion was 32 ms.
Undulation of the Moho is observed beneath between OBS35 and OBS50, a region which corresponds to the transition from the SB to KPR. We consider the variation to be well constrained because its wavelength is comparable to the variation recovered in the checkerboard tests. An example of the fit to the travel times and the ray diagram obtained by forward modeling are shown in Fig. 6(b). Crustal layering in SPr11 shows the same features as those of SPr10 and SPr7. The crustal thickness along SPr11 is ∼5 km except for the eastern part of SPr11 near the Izu-Ogasawara Island arc. Although the V p model in Fig. 3(c) can explain well the observed travel time data, the higher V p of 7.1–7.2 km/s at the bottom of the crust is preferable to fit the observed amplitudes of the later arrivals to the east of OBS070. Analysis of the MCS records for all lines revealed a very rugged acoustic basement in the SB, and the seafloor topography reflects this basement irregularity (Fig. 2). The thickness of the uppermost sedimentary layer decreases from north to south and usually from east to west, which demonstrates variation in the sediment supply from the Japan arc in the north and Izu-Ogasawara Island arc (IOA) in the east. With the exception of the Daini-Kinan and Koza Seamounts at the paleo-spreading center and the transition from the SB to KPR, the V p models for the three seismic lines across the Shikoku backarc basin obtained in this study show characteristics similar to those of the oceanic crust. The backarc basin crust comprises (1) an upper sedimentary layer, (2) oceanic Layer 2 (V p = 3.5–6.8 km/s, thickness 2–3.5 km), and (3) oceanic Layer 3 (V p = 6.8–7.2 km/s, thickness 2–6 km). The Daini-Kinan and Koza Seamounts also have Layer 2 and 3 velocities, but they both have a much thicker crust with thicknesses of 15 and 11 km, respectively. In contrast, a very thin crust with a minimum thickness of 3–4 km and a higher P n velocity of 8.1–8.3 km/s characterize the western end of the SB, which might have been formed during rifting and the initial spreading stages. In the eastern part of the SB, Nishizawa et al. (2006) were barely able to detect any crustal thinning at the Kinan Escarpment (KE), which is a 500-km-long fault with a maximum offset of 800 m that characterizes the transition zone between the IOA and SB (Fig. 1). Ishihara and Koda (2007) also identified KE as a narrow belt with an elevated mantle Bouguer gravity anomaly. In this study, we did not find any crustal thinning beneath the KE on SPr10 and SPr7. This result may be correlated with the smaller bathymetric offsets of the escarpment beneath SPr10 and SPr7 compared with that of Nishizawa et al. (2006). Crusts with a V p < 3.5 km/s thicken eastward from around the KE, and this thickening is related to the volcanic activity of the IOA. The thicker lower crust in the eastern ends of SPr10 and SPr11 compared to SPr7 may be associated with the closer distances from the bathymetric highs belonging to the IOA. Although the igneous crustal thickness of the SB varies along each seismic line, the rough average thickness of the backarc basin oceanic crust is 5–6 km/s for all lines and decreases southward, especially in Layer 3. A similar thin crust with a thin Layer 3 has also been reported in the Parece Vela Basin to the south of the SB (Nishizawa et al., 2007; Takahashi et al., 2008). The backarc basin crust of the eastern Philippine Sea plate is significantly thinner than both average oceanic crust, which is 7.1±0.8 km thick (White et al., 1992) and the typical oceanic crust recently surveyed in the NPB, which was produced with a fast spreading half-rate >8 cm/year at a mid-ocean ridge (Oikawa et al., 2010). The NPB crust, which is composed of an ∼2-km-thick oceanic Layer 2 and an ∼5-km-thick Layer 3 with V p = 6.8–7.1 km/s, is much more homogeneous than that of the SB. The difference in the crustal thickness between the SB and NPB is mainly due to Layer 3. The thinner crusts in the SB and Parece Vela Basin may relate to the low mantle temperature beneath the Philippine Sea plate, which was inferred by Komiya and Maruyama (2007). Another difference between the SB and NPB V p models is the P n velocity anisotropy. In the NPB, the high P n velocity is estimated to be 8.5–8.7 km/s in the inferred spreading direction, and the low V p is 7.9 km/s in the perpendicular direction, which indicates large P n anisotropy in the uppermost mantle (Oikawa et al., 2010). In the SB, P n velocity estimated in this study for the spreading direction is at most 8.1 km/s. On the other hand, P n velocity for the north-south line of Nishizawa et al. (2006) to the south of SPr10 (Fig. 1) was ∼8 km/s. At the northern end of SB, several seismic profiles parallel to the magnetic lineation have been carried out across the Nankai Trough (e.g., Kodaira et al., 2002; Nakanishi et al., 2002). Their P n velocities range from 7.8 to 8.0 km/s, which are slightly slower than those in the perpendicular direction, but it is difficult to demonstrate azimuthal P n velocity anisotropy in the uppermost mantle of the SB without further seismic lines in several different directions. 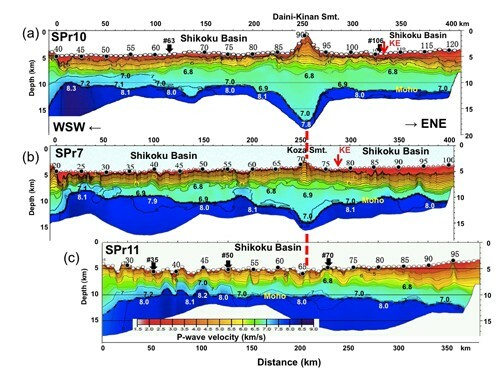 Nakanishi, A. et al., Crustal structure across the coseismic rupture zone of the 1944 Tonankai earthquake, the central Nankai Trough seismogenic zone, J. Geophys. Res., 107(B1), doi:10.1029/2001JB000424, 2002.